Technology is making newer advances everyday for the betterment of every field. The field of job-seeking is not an exception. While seeking a job, your resume is your most important asset. Now technology has made it possible to make your resume appealing and impressive to the optimum level with creative resume templates. 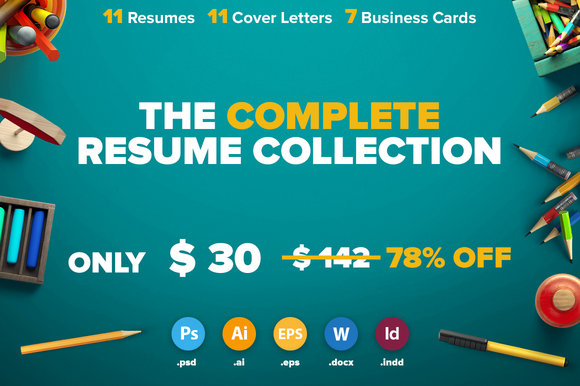 The Complete Resume Collection by 3Angle at Creative Market is one of their best and biggest resume template bundles and consists of 11 exclusive resume designs with multiple creative elements and layouts, along with InDesign files. Each of these templates has been carefully created so as to make it extremely easy for you to edit it and avail a great flexibility. They have given you so many choices in order to suit the requirements of your prospective employers of various types. The templates are black and white, but can be customized to be colored ones easily. So also, their structure can be changed and things can be added or deleted. And finally you can create an attractive, yet professional looking resume, just perfect to impress the employers. The bundle includes a “help” file too which provides editing recommendations and makes sure that you can tackle even the smallest issues. 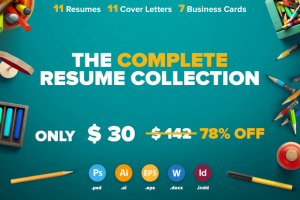 These templates have been carefully created and layered to make it extremely easy for you to build a great resume. There is demo data too included which will help you understand the structure so that you can just paste your information in. You need not buy the entire bundle, if you don’t want it. There are links given on the site clicking which you can buy them individually too. The templates are available at an incredible price! First download the ZIP file. Before opening every file, install the font. This is very important. FREE fonts are available for download. Now start editing as per your requirements and tastes. Once edited, save the files in PDF format. You are done! You can print the files whenever you want! Help is also provided for editing Photoshop files with a generic tutorial on the site. What do you think? Aren’t you feeling more confident than ever of having a great resume before going to your next interview?